Aung San Suu Kyi AC born 19 June 1945 in Rangoon, is a pro-democracy activist and leader of the National League for Democracy in Burma. During the military control of Myanmar, she was a noted prisoner of conscience and advocate of nonviolent resistance. For many years (1989-2010) she was held under house arrest. However, on her release, she led the National League for Democracy and serves as the first and incumbent State Counsellor, a position akin to a Prime Minister. From 2016, she has come under international criticism for failing to stem the persecution of the Rohingya people in Rakhine State on the border with Malaysia. 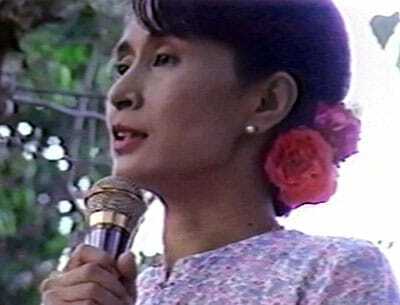 Aung San Suu Kyi was born on 19 June 1945 in Rangoon (then British Burma). She is the third child in her family. Her name is derived from three relatives; “Aung San” from her father, “Kyi” from her mother and “Suu” from her grandmother. Her father, Aung San, was instrumental in negotiating independence from Britain in 1947. He also founded the Burmese army and was assassinated by political rivals in late 1947. Suu Kyi studied at primary schools in Rangoon, before studying in India (graduating from New Delhi University, 1964) and St Hugh’s College, Oxford University (1968). After Oxford University, she worked for the United Nations for three years. In 1972 she married Michael Aris who was living in Bhutan – they had two children. In 1988 she returned to Burma to visit her ailing mother but became caught up in the 1988 uprising as protests against the Burmese Junta sprang up around the country. 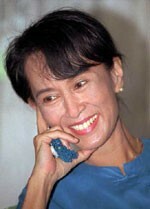 Suu Kyi became active in supporting the League for Democracy and soon became promoted to a prominent position in the movement. Suu Kyi, First public speech (26 August 1988). 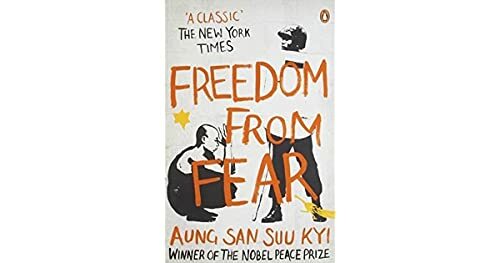 Around this time her husband was diagnosed with terminal cancer, but he was not allowed an entry visa to the country, however, despite her husband’s ailing health Suu Kyi was reluctant to leave now she had a prominent position in the movement for democracy. In 1989, she was placed under house arrest by the military junta. She was told she could have freedom if she agreed to leave the country, but she preferred to stay. Under house arrest, she spent time studying Buddhism and political activism and remained popular with those who supported the ideals of democracy in Myanmar. For her principled, non-violent protest against the military and support for democratic principles, she was lauded by many human rights groups and influential bodies around the world. Suu Kyi won the Rafto Prize and the Sakharov Prize for Freedom of Thought in 1990 and the Nobel Peace Prize in 1991. In 1992, she was awarded the Jawaharlal Nehru peace prize by the Government of India for her peaceful and non-violent struggle under a military dictatorship. For many years she was kept under house arrest, with the Burmese junta repeatedly extending her detention. According to the results of the 1990 general election, Suu Kyi earned the right to be Prime Minister, as leader of the winning National League for Democracy party, but her detention by the military junta prevented her from assuming that role. She is frequently called Daw Aung San Suu Kyi; Daw is not part of her name, but an honorific similar to madam for older, revered women, literally meaning “aunt”. Strictly speaking, her given name is equivalent to her full name, but it is acceptable to refer to her as “Ms. Suu Kyi” or Dr. Suu Kyi, since those syllables serve to distinguish her from her father, General Aung San, who is considered to be the father of modern-day Burma. The U2 album All That You Can’t Leave Behind was banned in Burma because one of the songs (Walk On) was written about her struggle and how, even when the government threatened her, she “walked on” the other way. On 2 May 2012, she was elected to the National Parliament with other Democrat MPs. In 2015, her party, the National League for Democracy won a sweeping victory, although she was ineligible for the Presidency (due to provisions which prevented widows and mother of foreigners.) She claimed she would hold the real power in the new government. The president, Htin Kyaw, created a new role for her – the position of State Counsellor on 1 April 2016. This enabled her to assume the dominant position in the government. In December 2016, the United Nations strongly criticized the Myanmar government for its poor treatment of the Rohingya people, and called its approach “callous” and warned of possible crimes against humanity. The United Nations called on Aung San Suu Kyi to end her silence and stand up for the oppressed Rohingya minority. Citation: Pettinger, Tejvan. “Biography of Aung San Suu Kyi”, Oxford, UK – www.biographyonline.net. First published 17 March 2009. Last updated 6 February 2018.